Disney’s Egg-stravaganza Scavenger Hunt is here, and the Disney California Adventure Food & Wine Festival and Get Your Ears on Celebration continue! 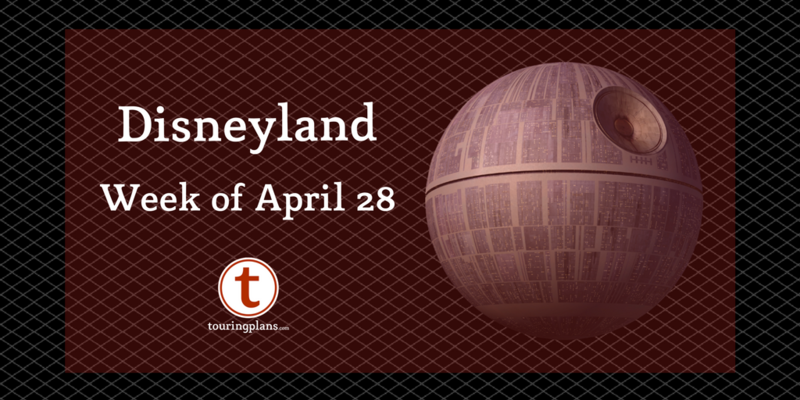 Read on to find out about this and more in this week’s Disneyland news. 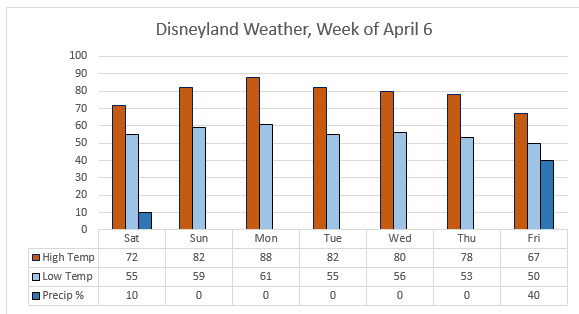 Disney California Adventure’s Food & Wine Festival remains the primary draw at Disneyland resort this week, which continues through April 23, 2019. This annual event includes culinary demonstrations and seminars as well as food kiosks featuring small bites and tastes, and is definitely worth a visit. There are several special events that take place during this event as well, including wine tastings, seminars, and special meals. For more details and information on how to make reservations (which are recommended), please check here. As per usual, the Annual Passholder corner will be passing out commemorative buttons and have special photo opportunities for Passholders. Have you had a chance to try Disney’s Egg-stravaganza Scavenger Hunt? Check out this post for more details, but let us know in the comments what you’ve thought of it if you’ve already done it! Disneyland is continuing its Get Your Ears On Celebration, commemorating 90 years of Mickey and Minnie Mouse. Keep your eyes open for special menu selections, treats, character greetings, entertainment, and merchandise throughout the resort. Make sure you check out Rikki’s preview and Guy’s rundown of the best snacks for more details on what to expect! 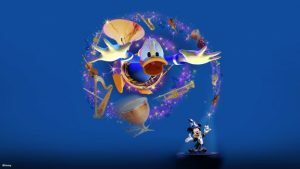 As part of that, Disney has announced that Philharmagic, the long-running show at Magic Kingdom, will be debuting this month at the Sunset Showcase Theater in Hollywood Land. Keep you eyes open for it soon! As a reminder, Disney has announced some new rules and restrictions on stroller size (including no stroller wagons allowed), smoking prohibitions (no more smoking areas in the parks or at Downtown Disney), and restrictions on ways to keep coolers/cooler bags chilled (no loose ice or dry ice). These restrictions take place May 1 for the stroller and smoking changes, while the ice restrictions are already in effect. You can read the official details here. 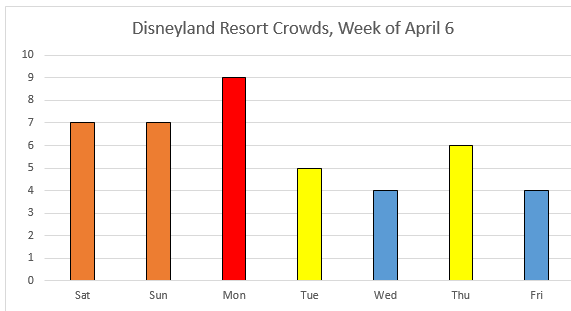 Crowds are highly variable this week, peaking with level 9 crowds on Monday, but dropping all the way to level 4 on Wednesday and Friday. This is another week with quite a bit of variation in the forecast, with highs ranging from a chilly 67 on Friday, all the way up to 88 degrees on Monday. Note that there is a decent (40%) chance of rain on Friday. 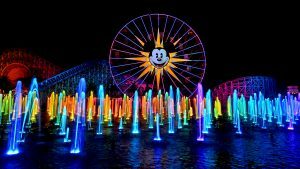 Disneyland has a full slate of entertainment this week, with Mickey’s Mix Magic, Mickey’s Soundsational Parade, World of Color, and Fantasmic! shown at least once a day each. 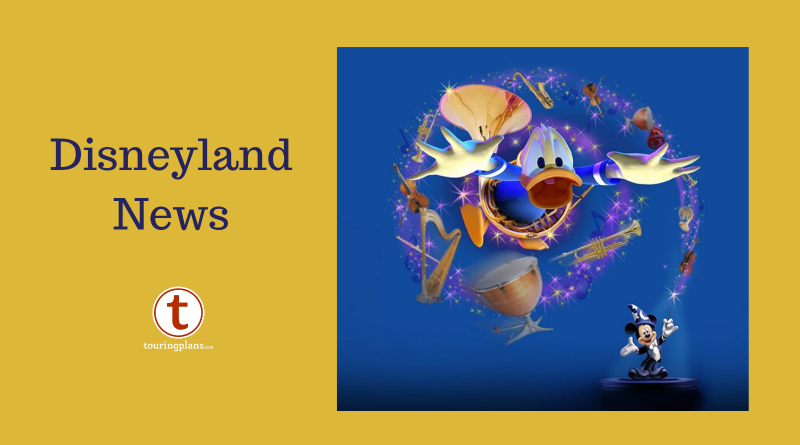 Detailed show schedules, including smaller diversions like The Dapper Dans, can be found here. Deluxe, Southern California, and Southern California Select Passholders are blocked out on Saturday, with Select and Southern California Passholders also blocked out on Sunday, and Select Passholders also blocked out on Friday. For those of you buying tickets as day guests, single-day tickets are Peak Price ($149/$141) every day. At Disneyland Park, the Sleeping Beauty Castle Walkthrough remains offline as the castle remains under a scrim for renovations. Over at California Adventure, the Silly Symphony Swings are still offline indefinitely — we’ll let you know when we have a projected end date. Also, the Red Car Trolley is going dark until next spring. July 31, 2008 Recent News Comments Off on StormStruck to soft open?